Tired of packing bags of batteries in your backpack? Bored with the heavy external battery which needs recharge in advance? Simply unfold a Suaoki solar panel and have peace of mind for enjoying the clean and unlimited power from the directly sunlight. Intelligent chip inside will automatically detect fastest possible charge currency for your device and SUNPOWER monocrystalline solar panel will offer up to 25% high conversion efficiency to achieve high speed charging. What?ˉs more, you could charge charge your mobile devices powered by sunlight, meanwhile charging your car by the included car charger via the DC port or charge the storage battery by using the clamp. Paper size bag after quad-fold make it perfect for outdoor activity, e.g. hiking, traveling, etc. Evenly placed eyehole and mounting loops enables easy attachment to your backpack. 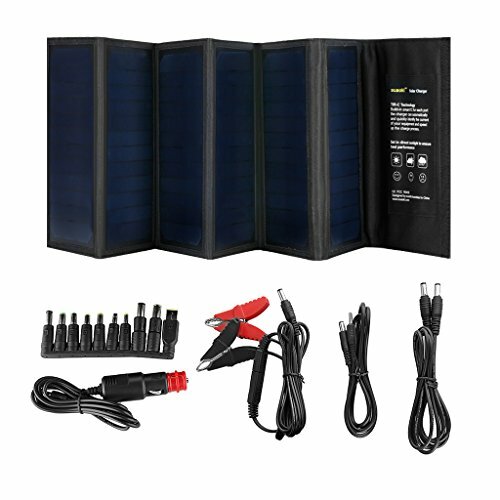 In Addition, the industry grade PET panels are bound together with heavy-duty polyester canvas, equipping this solar charger with water-resistant feature.